SOUTH PASADENA, CA--(Marketwired - November 28, 2014) - Dr. A.J. Vashi, who offers affordable cosmetic dentistry, is now using a revolutionary short-term orthodontic solution that can straighter teeth in just a few short months. Six Month Smiles is a popular orthodontic treatment that uses clear brackets and wires to straighten teeth in as little as six months. The solution is faster and less expensive than traditional metal braces or Invisalign clear aligners, because the procedure focuses only on teeth that show when someone smiles. Dr. Vashi has trained in the art of strategically placing Six Month Smiles braces on adults and teenagers. 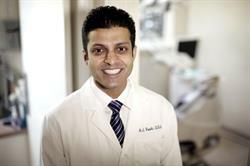 The Six Month Smiles Patient Tray Kit allows Dr. Vashi to customize treatment for every patient. Much like metal braces, patients are advised to wear a retainer following their treatment to maintain their beautiful smile. Dr. Vashi said the procedure has been popular for patients who want the unobtrusive quality of Invisalign and the results of traditional metal braces. "This is a great services that allows us to cut down orthodontic treatment time with incredible results," said Dr. Vashi, a trusted cosmetic and family dentist. "This method combines the best qualities of Invisalign and metal braces to provide easier and faster treatment." Dr. Vashi's South Pasadena dental practice, located at 1928 Huntington Drive, South Pasadena, Calif., has been serving the community since 2003. He provides cosmetic dental treatments like Six Month Smiles, veneers, teeth whitening and Invisalign, as well as preventive care, dental implants and sleep appliances. Dr. Vashi uses CEREC Technology, a 3-D imaging and in-office milling system, that allows him to design and then place permanent crowns, inlays and onlays in just one visit. The restorations are made from high-grade ceramic that is less prone to cracking, and there is no need for a temporary placement. CEREC restorations have become popular options for patients with missing fillings or broken teeth. Dr. Vashi, a Los Angeles native, is a graduate of the University of the Pacific School of Dentistry in San Francisco. He received an undergraduate degree in cell biology and biochemistry from the University of California in San Diego. After achieving his dental degree, Dr. Vashi gained hundreds of hours of continuing education in implant and cosmetic dentistry. He has served on the San Gabriel Dental Society for more than eight years and was the board's youngest president. He participates in many community events and organizations including the South Pasadena Chamber of Commerce, Give Kids a Smile and Young and Healthy in Pasadena. Dr. Vashi has served on the faculty of the University of Southern California, School of Dentistry, and he is currently a member of the American Academy of Cosmetic Dentistry, California Dental Association, American Dental Association and Academy of General Dentistry. To view individual dental plans or find out how much does teeth whitening cost at the coastal cosmetic family dentistry practice, visit the website www.SouthPasadenaSmiles.com or call the office at 626-219-7172. Dr. A.J. Vashi, who offers affordable cosmetic dentistry, is now using a revolutionary short-term orthodontic solution that can straighter teeth in just a few short months. Six Month Smiles is a popular orthodontic treatment that uses clear brackets and wires to straighten teeth in as little as six months. The solution is faster and less expensive than traditional metal braces or Invisalign clear aligners, because the procedure focuses only on teeth that show when someone smiles. Dr. Vashi has trained in the art of strategically placing Six Month Smiles braces on adults and teenagers. Dr. AJ Vashi’s South Pasadena dental practice has been serving the community since 2003. He provides general, cosmetic and implant dentistry. Dr. Vashi, a Los Angeles native, is a graduate of the University of the Pacific School of Dentistry in San Francisco. After achieving his dental degree, Dr. Vashi gained hundreds of hours of continuing education in implant and cosmetic dentistry. Dr. Vashi has served on the faculty of the University of Southern California School of Dentistry, and he is currently a member of the American Academy of Cosmetic Dentistry, California Dental Association, American Dental Association and Academy of General Dentistry.